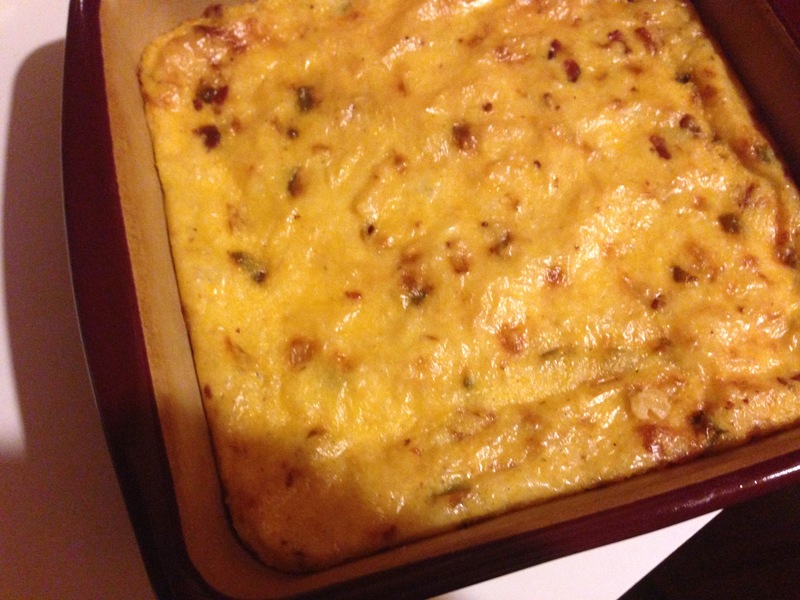 I posted the original cheesy grits casserole a while ago. But since it’s one of my go-to recipes that I make regularly, I started to tweak it. I now think my updated recipe makes a big difference and is even more delish than the original. Enjoy! 1. Cook bacon in pan sprayed with non-stick cooking spray, drain, chop, and set aside. 2. Chop green bell pepper and onion and salute in pan bacon was cooked in, until tender. Then set aside. 3. In a 2-qt. pot, heat water and salt to boiling. 4. Gradually add grits and return to boiling. 6. Simmer uncovered, stirring for 5 minutes. 7. Remove from heat and allow to cool, slightly. 8. Add cheese, butter and eggs, mix well to ensure all of the grits are incorporated. 9. Stir in bacon bits, green bell pepper, and onion until combined. 10. Bake at 350 degrees until a light golden brown, about 50 minutes.